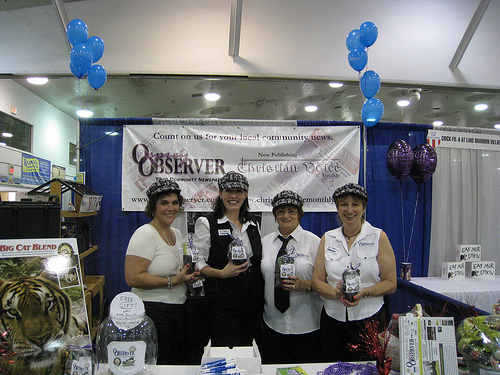 The 2011 Brandon Business Expo and Taste of Brandon will take place Thursday, May 19, from 3:30-8 p.m., in the special events center at the Florida State Fairgrounds. The Greater Brandon Chamber of Commerce will hold the 2011 Brandon Business Expo & Taste of Brandon on Thursday, May 19, from 3:30-8 p.m., in the special events center at the Florida State Fairgrounds, located at U.S. Hwy. 301 and I-4. The Brandon Business Expo will celebrate its 23rd anniversary with another spectacular event open to the entire community. The event has a trade-show setting and annual taste-off competition. Business industries of all types are welcomed and encouraged to exhibit. The 2011 Presenting Sponsors for the event are Ed Morse Cadillac of Brandon and Brandon Auto Mall. Media sponsor for the event is The St. Petersburg Times/The Brandon & South Shore Times. Supporting Sponsors include MidFlorida Credit Union, MetroPCS, Sam’s Club of Brandon, Tampa Electric Company and APAC. Individual tickets to the event are now available, www.brandonchamber.com, Tickets purchased in advance of Thursday, May 19 are $10. Tickets purchased at the door will be $15. All tickets include single admittance into the show, raffle prizes, give-a-ways, food sampling from all participants and an opportunity to vote for your favorites. The 2011 Taste of Brandon participants include: Buffalo Wild Wings, Cali Viejo Restaurant, Chick-fil-A at Lake Brandon Village, last year’s winner Copper Bell Café, GrillSmith, Hooters, Hungry Howie’s Pizza & Subs, Jaymer-Que Southern BBQ, LeAnne’s Old Fashioned Cookies, Mango’s @ Embassy Suites-Tampa/Brandon, Mimi’s Café, Ms. Cyndi’s Corner Café, Planet Smoothie, Sinigual Contemporary Mexican Cuisine, Smokey Bones BBQ and Grill, Tabitha’s Tea Room, The Rack Sushi Bar & Billiards Lounge, Tres Amigos Cantina, Uncle Mike’s Smokehouse Grill and Village Inn. Additional taste participants are welcome encouraged to participate. For registration information, contact Jamie Reid with The Greater Brandon Chamber of Commerce at 689-1221, ext. 8843, or jreid@brandonchamber.com. Registration is also available online at www.brandonchamber.com.